Challenge #2 for Iron Craft ’13 was to make something using the orange, either the color or the fruit. I really struggled with this challenge, which is funny as I’m the one who posed it. I had plans to make pillar candles with dried oranges embedded in the sides, but that ended up being a little more of a challenge than I was up for. Next, I thought I’d make a color blocked sweater by taking two sweaters apart and resewing them. Of course, I couldn’t find the right two sweaters to take apart. So, I ended up going to my old stand-by, knitting. 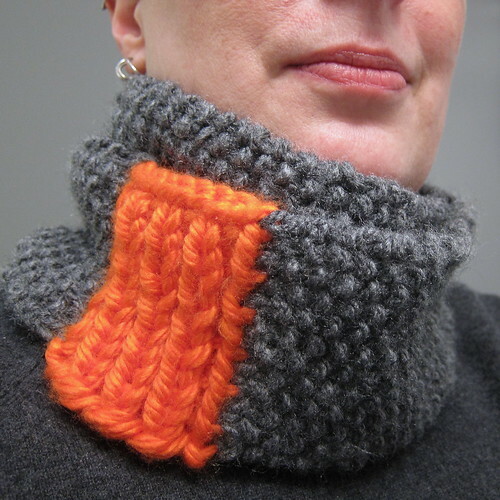 I kept with my color blocking idea and came up with this cowl. I made this cowl to keep me warm, so it is just long enough to loop twice and fit over my head. I didn’t want it to drape like a decorative scarf. You, of course, can make it longer if that is the look you are going for. I played with textured a bit on this cowl too. The orange slice is knit first in a k1, p1 ribbing, then stitches are picked up from the side of that orange piece with the grey yarn and knit in seed stitch. Despite the fact you are using a bulky weight yarn, the results are not overly bulky. 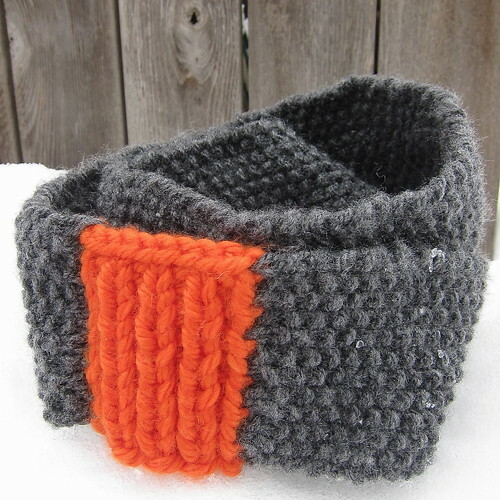 Download a copy of the Orange Slice Cowl Pattern. With the orange yarn and size 11 needles, cast on 9 stitches. 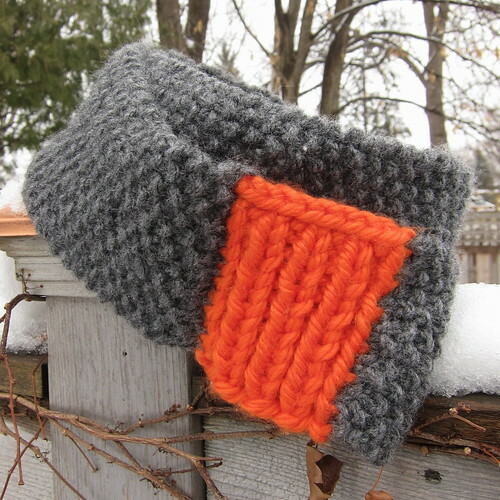 With the grey yarn, pick up and knit 12 stitches along one side of the orange piece. (Along a side not the top or bottom). Work these stitches in seed stitch. Repeat rows 1 and 2 for desired length. 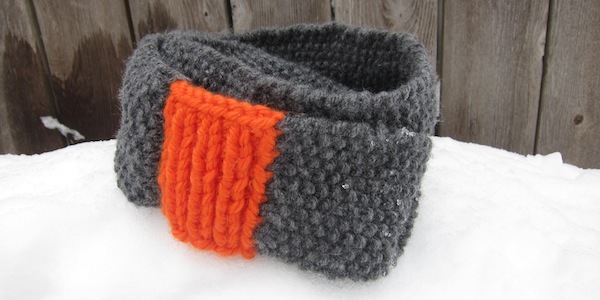 My cowl is 45″ total, 3 inches of orange and 42″ of grey. Bind off the grey and seam to the other side of the orange slice. Weave in ends. Block if desired. For personal use only. Please do not duplicate for distribution, sell or teach this pattern without permission. 6 years ago by Kat in Challenges , Iron Craft , Knitting , Knitting Projects , Needlecraft , Projects | You can follow any responses to this entry through the RSS feed. You can leave a response, or trackback from your own site. I can’t even say how much I love this. It’s such a simple, clean design, and I love the pop of color! Oh wow I absolutely love the orange and grey combination. Then again I would combine everything with grey, it is such a versatile colour. This came off really well, you’re right it does look a little like sunshine. Great job! I agree that it is hard to find the right shade of orange yarn. I have to say that I had a lot of fun with this challenge. Orange is fantastic! So cute! I love the gray and the orange together, too.